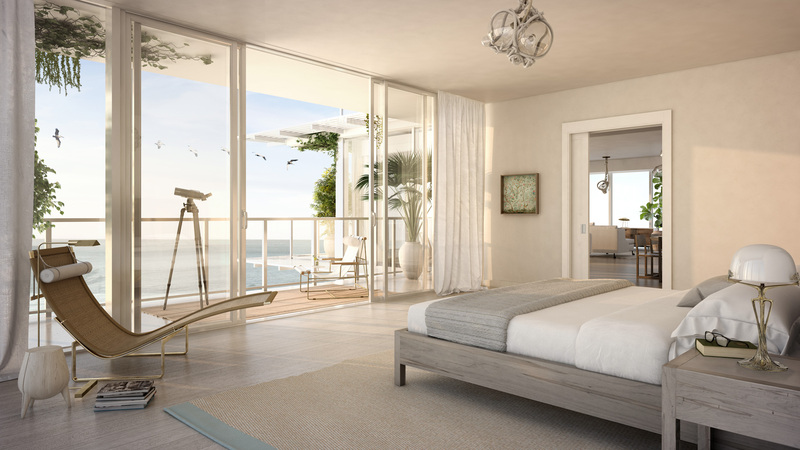 DDG broke ground and began construction on its newest luxury condominium development, 3550 South Ocean in Palm Beach, Florida. The seven-story building will feature 30-units starting at the price of $1.875 million. Unit sales started earlier this year for the oceanfront property, now with 20 percent already sold. The development comprises two- and three-bedroom residences, along with five three-bed, three-and-a-half bathroom penthouses ranging from 2,700 to more than 3,000 square feet. Interior features include direct elevator access, private balconies with sliding glass doors, private entry foyers, direct water views, open floorplans, chef-caliber kitchens with custom islands composed of intricate stonework, solid oak flooring, floor-to-ceiling glass windows and open living areas. Residents will have access to luxury amenities such as a saltwater swimming pool and sun terrace, private beach access, on-site surf board and stand-up paddleboard storage, a fitness studio, private garage access and private parking. The company partnered with The Wright Fit to provide residents with lifestyle services including massages, indoor and outdoor private training and yoga and fitness classes. In collaboration with Star Jets International, residents will have access to concierge jet services including door-to-door car transfers, itinerary customization, jet selection and on-board catering. Developed, built, and managed by DDG, the firm is also partnering with Garcia Stromberg, Kobi Karp Architecture and Champalimaud on the project. Completion of the development is scheduled for late 2018.